Trying to find the right angle grinder can be a truly monumental task as the market is rife with seemingly viable options. This review aims to shine a light on one of the trending models currently available: the VonHaus 20V Max Cordless Angle Grinder. We’ll have an in-depth look at what this angle grinder has to offer and whether it’s the right model for your tasks or not. Vonhaus is one of the renowned power tool companies that produce everything from vacuum cleaners to angle grinders and electric saws. The diversity of their products has seen their brand recognition significantly increase through numerous markets as they continue to build upon their prestigious history as a successful power tool company. The Vonhaus 20V Max Cordless Angle Grinder is a product for those looking to get themselves a well-built and durable angle grinder that can perform to the highest standards while offering that little extra over other models. Having an angle grinder at such an affordable price with such a high RPM is extremely rare. With 11,000 RPM, users can smoothly cut through objects with very little resistance, making it ideal for cutting through hard-to-reach items as you don’t need to rely on as much pressure as you may do with other angle grinders. Quality battery: Loaded with a 20V maximum 4.0Ah lithium-ion battery, this tool will provide you longer cutting times. Also, with fast 100-minute charge time, this tool lets you get back to cutting and grinding in no time. Universal compatibility: This tool comes with a 4-1/2″ grinding disc, which is compatible with the more common 115mm discs. Adjustable auxiliary handle: The handle that is integrated into this tool can be adjusted to the left or right side depending upon the hand orientation of the user. This also adds a higher level of stability and control over the grinder as well as being a storage location for the wrench. Safe to use: The manufacturer equipped this device with a two-stage safety trigger to prevent any unintentional starts. Quality motor and construction: This power tool is integrated with an 11,000 RPM high spec motor to provide smooth operation, and has a gear head that is crafted with cast aluminum. When it comes to using angle grinders, safety should be at the top of your list as these are powerful tools. Once you’ve secured your handguard, put on some gloves, and found your full-face mask, it’s time to grind. The VonHaus has some weight to it which helps with control, so you’ll also want to securely grip the auxiliary handle in order to guide the head of the tool to its intended location. It’s also important that when cutting or grinding, you don’t apply too much pressure to the angle grinder as this can cause the disc to bend and possibly snap. You’ll also want to position yourself in a stable stance, pointing towards the object you’re cutting or grinding so that you can slowly add incremental amounts of pressure by leaning into it. This will help provide a smooth and precise cut. If you’re looking to stay with the VonHaus brand and aren’t particularly worried about having a battery operated angle grinder, then you should take a look at the VonHaus 2200W 9″ Angle Grinder. This has an incredibly powerful motor combined with the ability to hold larger discs (230mm), making it an ideal grinder for heavy-duty operations like cutting stone and concrete. It’s even backed by VonHaus’ two-year warranty upon registration. 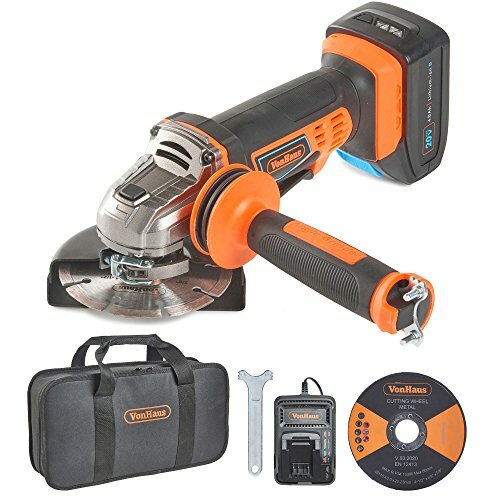 Perhaps you’re looking for something similar to the VonHaus DCG412B, but you’re interested in trying a new brand. If this is the case, then the Milwaukee 2680-20 M18 could just be the angle grinder you’re looking for. Milwaukee is an extremely established brand known for the quality and durability of their products. The M18 uses an 18-volt battery to power its motor that can drive the disc up to a speed of 10,000 RPM. This power can be controlled through the rubberized auxiliary handle that can be locked into three different positions. The VonHaus DCG412B is an incredibly generous set. The fact that a battery is included in the package means that users can get to work as soon as their grinder arrives. The tool’s relatively compact size makes it great for extended periods of use and for people who are continuously moving around the work site and don’t want to have to unplug and plug a tool every few minutes. Overall, this model is great for those who are looking for a reliable grinder that can efficiently perform numerous functions and all for a reasonable price.